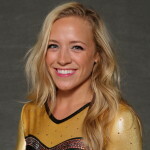 The Gustavus gymnastics team showed a big improvement Friday from its first meet of the season last week, scoring 182.400 in a Wisconsin Intercollegiate Athletic Conference dual loss to Winona State, who tallied 184.150. The jump of nearly seven points from last week is the largest team score improvement in consecutive meets since the 2011 season. 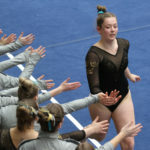 The Gustavus gymnastics team started its season Saturday with a dual victory for the first time since 2007, defeating the University of Wisconsin-Oshkosh 175.550-174.725 in a Wisconsin Intercollegiate Athletic Conference meet. 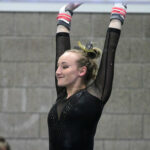 The Gustavus gymnastics team dropped a WIAC dual meet 189.100-178.750 to UW-Whitewater on Saturday evening. 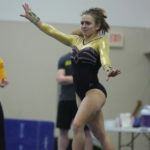 The loss moves the Gusties to 1-3 in dual meets, while the Warhawks improve to 2-1.